Like fresh air and enjoy supporting a great cause? The Colchester Milton Rotary is hosting the 6th annual Fun Run! Proceeds will be shared with the Colchester, Milton and Grand Isle food shelves. Register now to reserve your t-shirt, bring the kids, walk your dog, challenge all your Fitbit friends! The more the merrier. An early start gives you the rest of the day to enjoy. 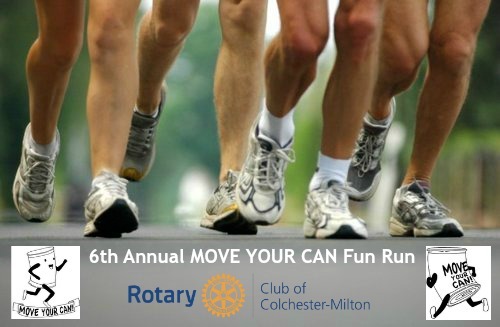 The Colchester – Milton Rotary Club is hosting the 6th annual MOVE YOUR CAN Fun Run & Walk event Saturday, June 9th at 8:15 AM. The event is a 5K (roughly 3 miles), family oriented and will start and finish at Bayside Park in Colchester. KIDS AND DOGS ARE WELCOME! The purpose of this event is to raise money for the Charitable Fund of the Colchester Milton Rotary Club and to support the local food shelves of Colchester, Milton, and Grand Isle Counties. The entry fee is $25 for adults and $15 for kids under the age of 16. Please also bring a non-perishable food donation. Monetary donations accepted as well. Each participant will be provided with snacks and an event T-shirt. Please Register prior to June 1st to receive a t-shirt at the race. Race day registration will begin at 7:30 am and the race will begin at 8:15 am. The event starts and finishes at the Pavilion at Bayside Park in Colchester Vermont. All ages and abilities are welcome. Please email Will Hamilton with any questions. Rotary is an organization of business and professional leaders united worldwide, who provide humanitarian service, encourage high ethical standards in all vocations, and help build goodwill and peace in the world. There are approximately 1.2 million Rotarians, members of more than 29,000 Rotary clubs in 161 countries. The Colchester-Milton Club has 40+ members. Rotary is a 501(C)3 so your donation will be tax deductible.